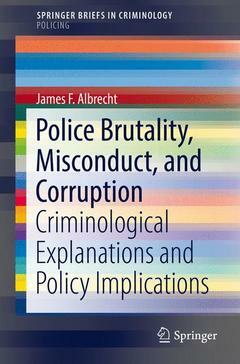 Police Brutality, Misconduct, and Corruption Albrecht James F.
Add to cart the imprimé à la demande of Albrecht James F.
This Brief proposes a criminological typology for understanding and addressing police misconduct. Through examination of each major type of police misconduct, the author proposes future research directions to deter and prevent misconduct. According to an examination of 50 years of police misconduct cases within the New York Police Department (NYPD) and Los Angeles Police Department (LAPD), the author proposes 5 major typologies: police corruption, police criminality, excessive use of force, abuse of authority, and police misconduct. Through a systematic examination of each of these five types, the author aims to break down the nebulous topic of police misbehavior into manageable categories, with their own set of causes, and recommendations for detection and prevention. This work will be of interest for researchers in criminology and criminal justice, particularly with an interest in police studies, and related fields such as public policy and sociology. It will also be of interest for policymakers. Chapter 1: Introduction and Overview.- Chapter 2: Understanding Police Deviance.- Chapter 3: Timetable of Police Deviance and Serious Misconduct in the USA.- Chapter 4: Criminological Explanations for Police Deviance.- Chapter 5: Recommendations for Enhancing Police Integrity and Professionalism.- Chapter 6: Discussion and Conclusion. James Albrecht is presently an Assistant Professor in the Department of Criminal Justice and Homeland Security at Pace University in New York. James Albrecht received a prestigious Fulbright Fellowship in 1998 and worked as a Professor at the National Police College of Finland, and is considered an authority in: Police Use of Force; Community/Zero Tolerance Policing initiatives; Police Response to Terrorism; Emergency Incident Planning and Management; Democratic Policing; Law Enforcement Leadership Practices; Corruption Control; Instituting Police Volunteer Programs; and other International Criminal Justice and Law Enforcement issues. Professor Albrecht has lectured at police facilities and universities in China, Taiwan, Russia, Germany, Austria, Sweden, Norway, Estonia, Finland, Italy, Turkey, Canada, Dubai, Kosovo, Macedonia, Malta, Ukraine, Trinidad & Tobago, the UK, and throughout the USA; and serves as a consultant to the United Nations, the US Department of Homeland Security, the International Association of Chiefs of Police, and the National Institute of Justice on terrorism and policing matters.